“Rethinking MBA Education”: this was the theme of discussion in the 2nd Annual Director’s meet @MBAuniverse.com, Bangalore Round table. The event saw presence of eminent Management Gurus, Educational Experts, visionaries, CXOs and Directors of some of the premier business institutions of India. 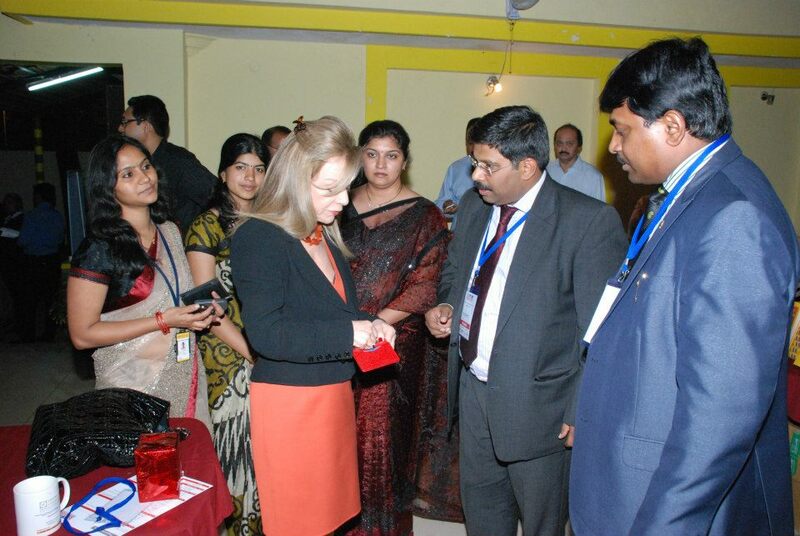 The event took place on 2nd of April, 2013 at Century Club, Bangalore. The Meet witnessed presence of around 150 Chancellors, Vice-Chancellors, Presidents, directors, deans and decision makers from leading universities and B-Schools from Bangalore, Hyderabad, Chennai, Mysore, Madurai, Coimbatore and the entire Southern region. Prominent speakers present in the meet were: Mr. D. Shiva Kumar (President-AIMA), Mr. Manish Sabharwal (Chairman-Team Lease Services), Mr Abhijit Bhaduri (Chief Learning Officer, WIPRO Group & Author of ‘Don’t Hire the Best’), Prof J Philip (Founder, XIME & Founder-President, AIMS and Directors), Prof William Verdini (Associate Dean and Director of External Relations, MYRA and Prof Emeritus, Arizona State University). The session started with the inaugural speech of Mr. Shiva Kumar on the theme of “Management Education at the Crossroads”. Highlighting the fact that management education has played a pivotal role in Indian business scenario in last few decades, he said, “Management education is about organizing simplicity in complexity. It makes you action orientated and reflects on issues. It creates entrepreneurs. It generates respect for consumer, customer, and partnerships”. Putting forth the urgent need to address the employability and introduction of skills in education as required by the market, Mr. Manish Sabharwal emphasized the need to rethink their “core purpose”. “B-schools that are only focusing on employability, whereas vocational training are facing a tough time”, he said. “B-schools need to create more ‘depth’ in their curriculum”, Mr. Abhijit Bhaduri said, “A mere focus on soft-skills and other cosmetic tools will not help”. Prof. J Philip in his speech stated that there is no cause of worry for well-meaning B-schools, who are offering quality education. Prof William Verdini delivered a thought provoking speech on ‘International experiences on building B-school & corporate relationships & its application in Indian context’. Dr. Sylvia Ann Hewlett (Harvard Business Publishing author of 11 books on Talent Management & HR) in her key note address spoke about woman empowerment from business management perspective and the need to recognize and promote woman managers. Following the discussion, Dr. Hari Krishna Maram, Founder CEO of Imperial College of Business Studies-Bangalore offered the vote of thanks for the successful event. The event was also attended by students from Imperial college of Business Studies-Bangalore who also contributed to the event by taking care of the registration process. Moreover, it was a good learning and intellectually stimulating session for the students and faculties of Imperial College of Business Studies-Bangalore. 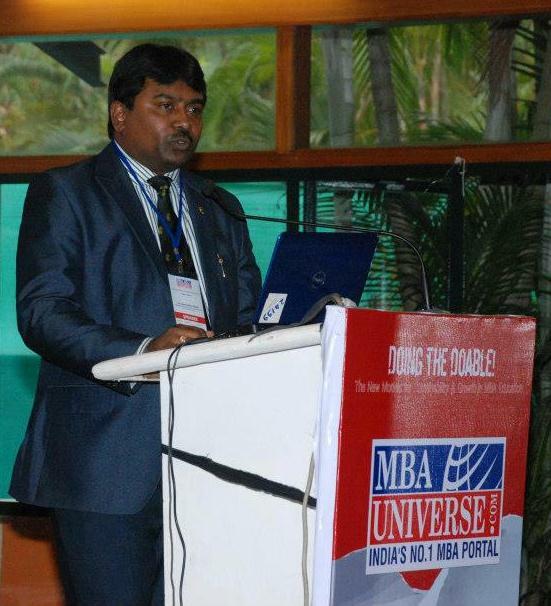 Dr. Hari Krishna Maram at Second round table Director’s meet MBAUniverse.com — at Century Club. Following the successful Annual Sports League organized at Imperial College of Business Studies-Bangalore, the campus witnessed one more spectacular event of the year: Evolution 2013-Break the Ice. The event encompassed a number of contests and students activities including Business Plan Contest, Mock Roadies Contest, Photography and treasure hunt. The event took place on 15th and 16th of March and was concluded on the annual day of Imperial College organized on 22nd of March. All the events took place under supervision of Ms. Nisha Chand (Assistant Professor and Event Co-coordinator) and contributed by the students of MBA first year of Imperial College. The event details are mentioned below. The mock roadies was conducted in three rounds: Group discussion, Written Test and Personal Interview. A total of 20 students participated and Judges were: Mr. Nav Kishalay and Mrs. Aruna Dooraisamy. 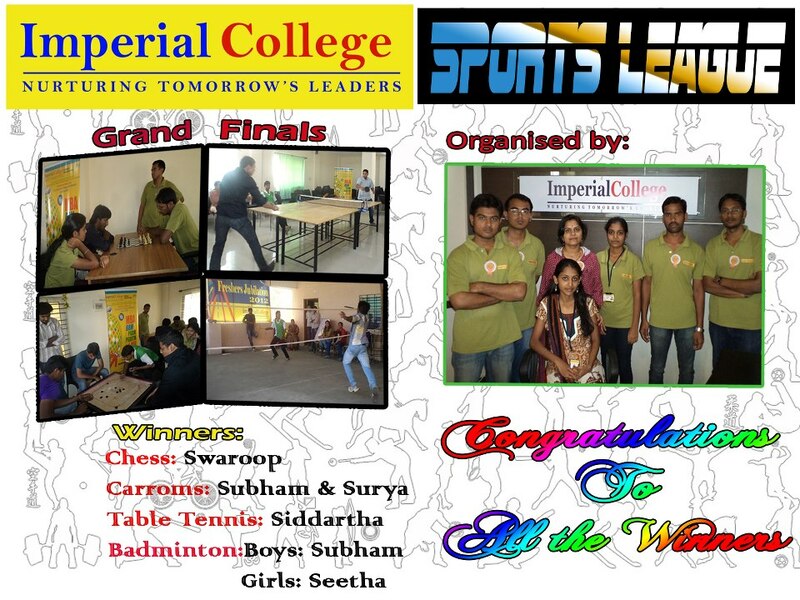 And finally, the most awaited “Annual Day of Imperial College” was celebrated on 22nd of March, 2013. This event was spectacular in terms of the multi-talented showcase of various cultural activities by the students of Imperial College. Inaugurated by CEO Dr. Hari Krishna Maram, the event saw presence of a host of guests which includes Mrs. Ganga Bhavani Maram, Mrs. Aruna Dooraisamy, Mr. Nav Kishlay, Prof. Sonika Sharma, Ms. Vernica and Mr. Animesh. Prof. Sonika Sharma, Dean of Imperial College, gave the welcome speech. A Welcome dance was performed by MBA and PGDM students (Ms. Seeta and Ms. Geeta). This was followed by a number of individual and team performances in the various categories of events which includes MIME Show, Dance, Skit, fashion show and so on. Dr. Hari Krishna Maram addressed the students with an enthusiastic speech appreciating the collecting effort of the students in making the show a successful one. Finally, the prize distribution ceremony took place and the guests conferred the prizes to the successful students. The final vote of thanks was given by Assistant professor and event-coordinator Ms. Nisha Chand. 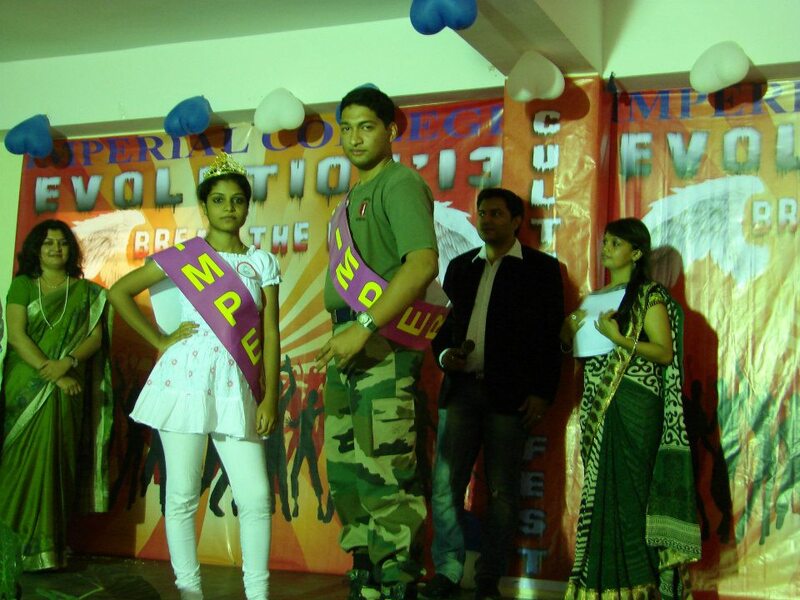 The winner of Mr. Imperial title was Mr. Varun Neil Das(MBA) and Ms. Imperial title was won by Ms. Geeta Rani(PGDM). Overall, the month of March was a very lively for Imperial College campus. The month witnessed a number of students’ activities including sports week, cultural events and annual day celebration. These moments will be cherished as golden and memorable moments of Imperial College in the days to come. Here is another entry in Students Article category of official blog of Imperial College. Ms. Rajeevi, a full-time student of Imperial College of Business Studies-Bangalore, shares her thought on the rising problems of waste management, specially when it comes to waste products generated from outdated electronic devices. Such waste products are not recyclable due to their obsolete usage and subsequent isolation in the backdrop of concurrent technological advancement. And as a result, it arises severe environmental hazards. Read more about it below. Happy Reading ! Last year, two inspectors from California’s hazardous waste agency were visiting an electronics recycling company near Fresno for a routine review of paperwork when they came across a warehouse the size of a football field, packed with tens of thousands of old computer monitors and televisions. The crumbling cardboard boxes, stacked in teetering rows, 9 feet high and 14 feet deep, were so sprawling that the inspectors needed cell phones to keep track of each other. The layer of broken glass on the floor and the lead-laden dust in the air was so thick that the inspectors soon left over safety concerns. Weeks later, the owner of the recycling company disappeared, abandoning the waste, and leaving behind a toxic hazard and a costly cleanup for the state and the warehouse’s owner. As recently as a few years ago, broken monitors and televisions like those piled in the warehouse were being recycled profitably. The big, glassy funnels inside these machines — known as cathode ray tubes, or CRTs — were melted down and turned into new ones. But flat-screen technology has made those monitors and televisions obsolete, decimating the demand for the recycled tube glass used in them and creating what industry experts call a “glass tsunami” as stockpiles of the useless material accumulate across the country. The predicament has highlighted how small changes in the marketplace can suddenly transform a product into a liability and demonstrates the difficulties that federal and state environmental regulators face in keeping up with these rapid shifts. “Lots of smaller recyclers are in over their heads, and the risk that they might abandon their stockpiles is very real,” said Jason Linnell of the Electronics Recycling Coordination Clearinghouse, an organization that represents state environmental regulators, electronics manufacturers and recyclers. In February, the group sent a letter to the Environmental Protection Agency asking for immediate help dealing with the rapidly growing stockpiles of the glass, much of which contains lead. With so few buyers of the leaded glass from the old monitors and televisions, recyclers have collected payments from states and electronics companies to get rid of the old machines. A small number of recyclers have developed new technology for cleaning the lead from the tube glass, but the bulk of this waste is being stored, sent to landfills or smelters, or disposed of in other ways that experts say are environmentally destructive. In 2004, recyclers were paid more than $200 a ton to provide glass from these monitors for use in new cathode ray tubes. The same companies now have to pay more than $200 a ton to get anyone to take the glass off their hands. So instead of recycling the waste, many recyclers have been storing millions of the monitors in warehouses, according to industry officials and experts. The practice is sometimes illegal since there are federal limits on how long a company can house the tubes, which are environmentally dangerous. Each one can include up to eight pounds of lead. The scrap metal industry estimates that the amount of electronic waste has more than doubled in the past five years. A little over a decade ago, there were at least 12 plants in the United States and 13 more worldwide that were taking these old televisions and monitors and using the cathode ray tube glass to produce new tubes. But now, there are only two plants in India doing this work. In 2009, after television broadcasters turned off their analog signals nationwide in favor of digital, millions of people threw away their old televisions and replaced them with sleeker flat-screen models. Since then, thousands of pounds of old televisions and other electronic waste have been surreptitiously unloaded at landfills in Nevada and Ohio and on roadsides in California and Maine. Most experts say that the larger solution to the growing electronic waste problem is for technology companies to design products that last longer, use fewer toxic components and are more easily recycled. Much of the industry, however, seems to be heading in the opposite direction. Cathode ray tubes have been largely replaced by flat panels that use fluorescent lights with highly toxic mercury in them, said Jim Puckett, director of Basel Action Network, an environmental advocacy group. Used panel screens from LCD televisions and monitors, for example, do not have much recycling value; so many recyclers are sending them to landfills. “True Heroes not only read, sing and dance but also play sports, so it is your turn to be a sport star at Imperial College”. This was the essence behind four days of mind-boggling, mettlesome and exciting sports event organized at Imperial College of Business Studies campus at Bangalore. Having commenced on 5th of March, this event witnessed a lot of energy pouring out from the enthusiastic student participants in various categories of sports. On 4th of March, the student managers nominated their team members and competitors through card-drawing process. The essence behind this card drawing effort was to ensure an equal to equity based transparent participation in the various sports event. Caroms ,Table Tennis, Chess, Badminton, On 5th of March, the sports league event was kick-started by the league matches for Carom competition. After a daylong mind-blowing competition, two teams got through the finals of Carom. On 6th of March, Chess competition was held and a total of 9 teams competed under this sports category. Four students entered into the semi-final: Mr. Swaroop, Mr. Nasir, Mr. Praveen and Mr. Sukumar. In the table tennis tournament, an intense competition prevailed in the league matches and finally Mr. Varun and Mr. Siddarth Chauhan entered into the Finals of Table Tennis. The four days of this sports event were quite a delightful experience for the student managers. They participated, competed and supported their fellow participants which created a very resonating and rejuvenating atmosphere in the campus. The nitty-gritty of this sports event was creations of a healthy competition and participation with a good team spirit. It was a good lesson in terms of team management and group dynamics. The token of appreciation also goes to the organizers who did a wonderful job by carrying out the event without much hassle. Overall, it was a much delightful, unforgettable and good learning lesson for the student managers at Imperial College of Business Studies. The happiness and the fun element that was insinuated from this event will linger in the minds of the students and the whole Imperial College fraternity for quite a long time. Session started by Mr. Ranjan Malik, Director & Partner Consultant, Erehwon Innovation Consulting on the topic “The Role Of Industry In Rebuilding Brand India”. He shared his experience about the top 10 country brands and important variables. Session speaker was Mr. D Shiva Kumar. He explained about the forces that will shape a country brand. Media, travel and social media are the main forces on today and he concluded his session by collective responsibility associations and metrics. 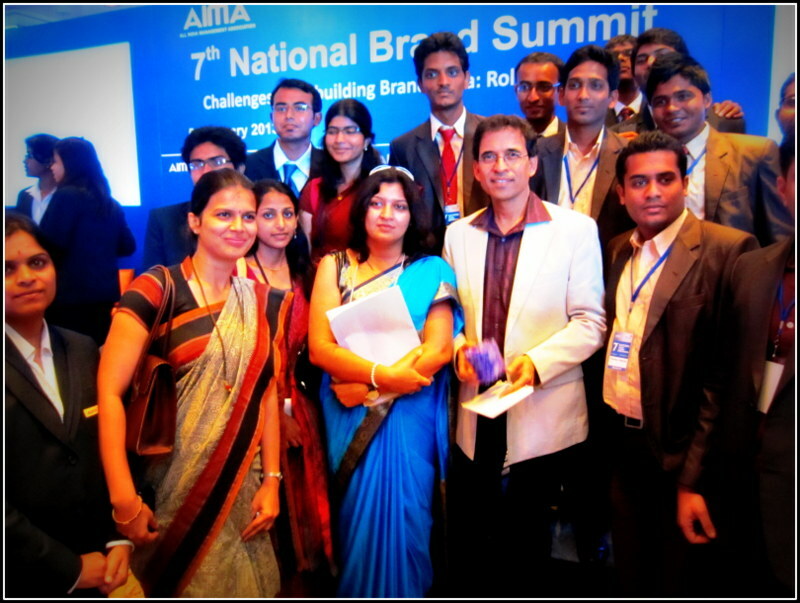 Speaker Mr. Bhaskar Bhat talked on Perception as the main objective for Rebuilding Brand India. Each country has its own individual perception may be on sliding growth rates, social issues, software genius many more. This session was about “The Role of the Youth in Rebuilding Brand India” and the speakers are Mr. Vishal Talreja, Founder & CEO – Dream A Dream, Mr. Aditi Bhat, Former VP, Operations, AIESEC, Lawyer with the Supreme court and Mr. Sanjay Vijay Kumar, Co- Founder & CEO, MobME Wireless Solutions. The summit witnessed a number of corporate scholars, Branding experts and people from different arena of the corporate and industries. Faculties and students from Imperial Collage of Business Studies also attended the summit and interacted with the corporate big shots It has been a consistent effort of Imperial College of Business Studies to provide its students maximum corporate/industrial exposure. This summit was a memorable and significant event for the ICBS students in terms of their learning and enlightenment with practical wisdom from industrial experts, Gurus and entrepreneurs. Creative thought process is a continuous evolution process and its importance in management education is widely acknowledged. From business management perspective, when we talk about innovation, we simply promote the importance of creativity in business process. Theater is an earlier version of creativity and it is still an important creative canvas which depicts the contemporary socio-cultural reflection of a society. Management students can get a good exposure to real-life creative thought process from this kind of Art. Imperial College of Business Studies organized such a Theater Workshop in its campus on 2nd of February, 2013. The workshop was conducted by Mr. Nav Kishlay, a Professional coach, Trainer, Life skills coach, Hypnotherapist, Actor, Director, Writer and Musician. Mr. Nav is a Certified Practitioner and Master Practitioner of NLP (Neuro Linguistic Programming) from David J Lincoln International, London, U.K. 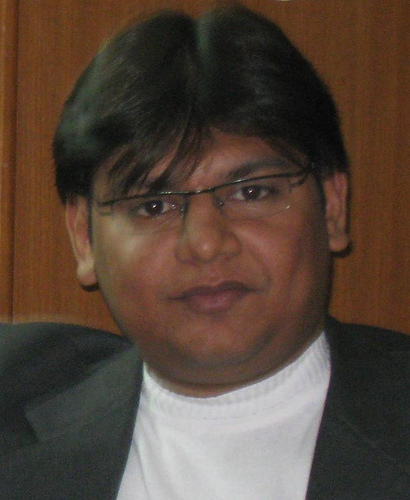 He is accredited by ANLP (Association of Neuro Linguistic Programming), India Chapter. He is also a certified Trainer in Train the Trainer courses for the same and is licensed to issue ANLP, India Chapter. Talking about the Art of theater the basic aspect of this Art is Acting and performance. In this workshop, the participants were shown a glimpse of the skill of theater through the concepts of emoting and body state. The methodologies used are Neuro-linguistic programming, Role play, Games, David Farmer dramatic Intervention. Students are given their names and they start working on the workshop from the same day. This allows the individuals to work with the team and formulate their own opinion about the story, characters, script and narration. There were some important out turns from the workshop. The students, if interested in this whole creative art, can get opportunity to work on this line of creative domain as mentioned below. The participants who would be interested further to be a part of the group would get a chance to Perform with Group Called BEING at different places Like In The Pink & Rangashankara in Bangalore. The Participants would get a chance to be a part of annual Full Length Play HUMMEIRAH which is slated to be performed at Rangashankara (Bangalore), Shri Ram Center((Delhi), Prtihvi Theater(Mumbai) from July 2013 to November 2013. The students of Imperial College were overwhelmed to learn the Art of theater performance from a very different perspective. This different technique of learning an Art can give a very different insight in honing one’s management skills as well. After all, management education is not only about developing one’s management skill, but it is more about understanding the whole management development process holistically and trying to use the best out of it. And Imperial College of Business Studies always emphasizes on this fact. It’s Placement Time at Imperial College of Business Studies !! Placement season has arrived at Imperial College of Business Studies with a boom! RICTS, a fast growing Global Business Process Delivery Company conducted its process and selected 15 students from ICBS. The process took place on 17th of November, 2012. RICTS basically provides business consulting services in marketing, information, web development, IT Services, BPO services and softwares. It is a leading provider of offshore business process outsourcing solutions to the Global clients. RICTS aims to build lasting relationships with its clients based on consistent high-quality service delivery, trust and confidence. The interview process was conducted in three different rounds. First round was a written test after which there was a group discussion round. 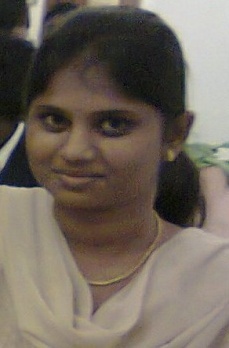 Finally students were selected on the basis of personal interviews. There were 35 students who applied for the process and 15 students were selected for on-board services at RICTS. The students were given various profiles in the field of Marketing, Human Resources and so on. GE is another company that conducted placement process at Imperial College. GE installed India’s first hydro power plant in 1902. Today, all of GE’s global businesses have a presence in India. The company participates in a wide range of manufacturing, services and technology businesses in the country. GE’s revenues in India are approximately US $ 2.8 billion. It exports over $1 billion in products and services. Employment across India exceeds 14,500. Another company visiting the campus was Ripples Learning. Ripples learning is a premier organization in workshop designing and it has identified specific competency areas which impact success at work. Its Competency Development Titles include cutting edge workshops designed to address areas of specific interest, such as personal effectiveness, leadership and communication. The workshops are carefully designed to challenge participants’ thinking and create significant shifts that empower individuals.